Welcome to the most thrilling sniper shooting game ever on the app store. Download “The Tribez in a War - Aerial Sniper Warfare of Nations” and get ready for the battle against these evil black guards. Your goal is to shoot and kill these enemy guards patroling the beach. Use your radar to locate their positions and shoot, be quick or they will shoot you. How to Play: Select your favourite sniper gun, tilt your device to aim and tap the screen to shoot. You have to kill a target number of guards in given time in order to clear the level. Controls: Tilt your device to aim and tap to shoot. Use the radar on the screen to locate the current position of enemy guards. 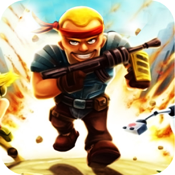 Features: • Different Guns to choose from • Universal app, play in HD on any iOS device, including iPads • Tight and fast paced game-play • Amazing graphics and backgrounds • Share your scores on Facebook or Twitter • Supports GameCenter It’s an addictive game, a must have in your IOS device if you love shooting and war games. Yes it is not easy to play at first and you’ll need some practice to be a pro. Play and compete with your friends. Enjoy!